Property Location With a stay at Holiday Inn Express Bahrain in Manama (Al Hoora), you'll be close to Bahrain National Museum and Al Muharraq Stadium. This 4-star hotel is within close proximity of Bahrain National Theater and Al Fateh Mosque. Rooms Make yourself at home in one of the 274 air-conditioned rooms featuring refrigerators. Complimentary wired and wireless Internet access keeps you connected, and satellite programming provides entertainment. Bathrooms have showers and hair dryers. Conveniences include safes and desks, and housekeeping is provided daily. Rec, Spa, Premium Amenities Take advantage of recreation opportunities such as a health club, or other amenities including complimentary wireless Internet access and a television in the lobby. 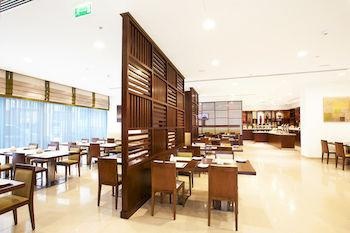 Dining Enjoy a satisfying meal at a restaurant serving guests of Holiday Inn Express Bahrain. Quench your thirst with your favorite drink at a bar/lounge. Business, Other Amenities Featured amenities include a 24-hour business center, a computer station, and complimentary newspapers in the lobby. This hotel has 3 meeting rooms available for events. Free self parking is available onsite. No room facilities. Dirty bathrooms. Dirty room.